This flavor-packed main course salad is bursting with summer bounty. Life is different when you live way out in the country. There's no traffic, no neighbors, no gang activity, no building codes! You can spent eight years putting up a big metal barn house, leave the doors unlocked, crank up the music, and let your seven donkeys bray through the night all they want. You can have seven donkeys in the first place. On the other hand, there's no mail delivery, no cell phone reception, no 911 service, and no high-speed Internet connection. And the closest halfway decent supermarket is 40 miles away. People who visit our remote Missouri farm usually have one of two reactions. It's either, "Wow, I would love to live in a place like this!" or "How in the world do you stand living out here—and where do you get a cappuccino at three o'clock in the morning?" Most men say something like, "This is great, but my wife would hate it." It's all a tradeoff, and one I'm happy to make—except for the supermarket part. Dashing to the store for a bunch of cilantro or a lemon is simply not an option. It took me three weeks to get the Kalamata olives for this salad. We do, however, have our own little commercial espresso machine, which definitely helps. You learn to adapt—and go without. My definition of seasonal eating? Stuff yourself with whatever there's plenty of, like the eight pounds of easy to grow Swiss chard I recently harvested from the greenhouse. Or the bounty from the 30 jalapeno pepper plants, 20 eggplant plants, and 250 feet of potatoes I (for some crazy reason) planted the first year I gardened in the country, back in 1995. Four varieties of homegrown onions planted March 31st and picked in late June. Beautiful summer produce is at its height right now, and all the fresh ingredients in this scrumptious main course salad are in season in many places. I used arugula, parsley, thyme, and red onions from my kitchen garden, new red potatoes from our Amish neighbors, and some Arkansas grape tomatoes I broke down and bought because my cherry tomatoes still won't be ready for weeks. The closest arugula for sale around here is 60 miles away, but thankfully this peppery, fast growing green is easy to grow from seed. And as a member of the brassica family (think broccoli, cabbage, and cauliflower), it's also really good for you. Arugula prefers cool weather, but this year I tried growing a spicier, heat tolerant strain called rucola selvatica, and it did great despite several days above 100°. What you see above is actually the second cutting. If you can't find arugula, some nice crunchy romaine (also called cos) lettuce would work well too. Or use a combination of the two. My favorite variety of romaine, pictured above, is an heirloom variety called Parris Island Cos, which tastes great and is amazingly heat tolerant. 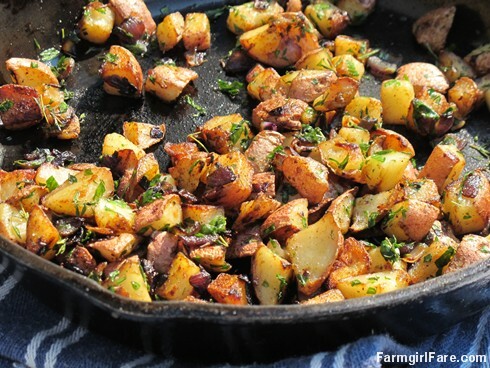 These pan-fried potatoes are also tasty straight from the skillet. New potatoes aren't a specific kind of potato, they're simply the first young, thin-skinned potatoes of the year that are dug up and eaten right from the ground, rather than being cured first. There's no need to peel them; just scrub off any dirt (some of the skin may scrub off too). Look for this seasonal treat at farmers' markets. The combination of ingredients and the vinaigrette are what's most important here, not the specific amounts. Once you've made the recipe, you'll be able to toss everything together more quickly the next time. The crisp potatoes taste great on their own, and the flavorful dressing is nice on other salad greens too. Use what you have: regular potatoes will work fine, as will yellow or white onions. A combination of those cute little yellow and red pear tomatoes would look very pretty. Chunks of larger tomatoes will give you a juicier salad. To make this a more substantial meal, simply add some slices of leftover grilled chicken or steak. As always, I urge you to seek out local and organic ingredients. They really do make a difference. 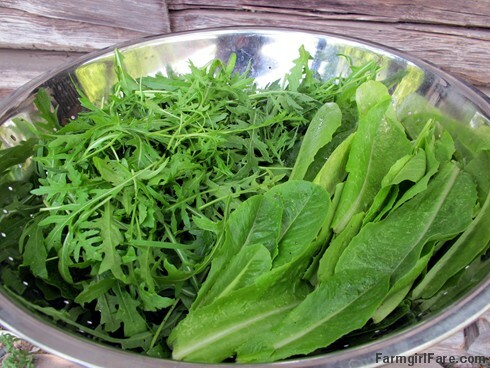 Place the arugula in a large bowl. Heat the remaining 2 Tablespoons of olive oil in a 10-inch or 12-inch skillet (I love cast iron skillets) over medium-high heat for about 30 seconds. Add the diced potatoes, sprinkle them with the salt and pepper, and cook, stirring occasionally, until the potatoes start to get brown and crisp, about 10 minutes. Reduce the heat to medium, and cook until the potatoes are tender, about 5 to 10 minutes. Add the onion and cook, stirring, until it's soft and starting to brown, about 5 minutes. Stir in the parsley and the remaining Tablespoon of thyme. Salt to taste. 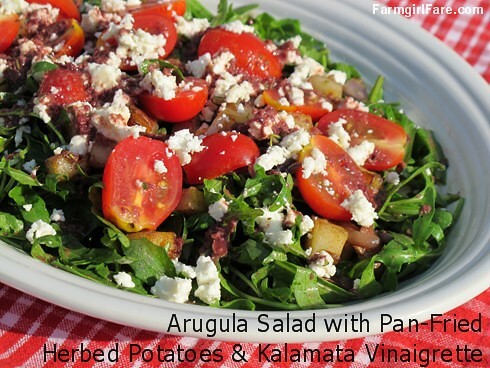 Toss the arugula with about half of the vinaigrette; you want it lightly coated. Portion the arugula onto four (or six) plates. Top it with the potato and onion mixture, the meat if using, and then the feta and tomatoes. Drizzle each plate with some of the remaining vinaigrette (you may not need it all) and serve. 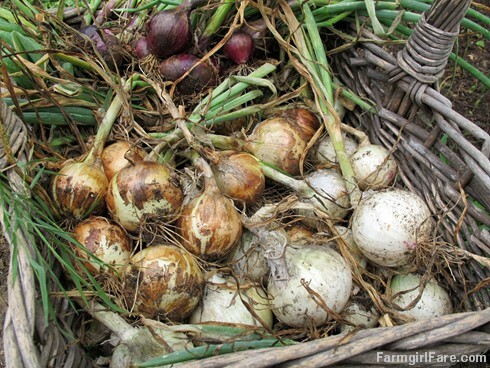 © FarmgirlFare.com, where something is always in season. Oh my gosh Susan, this looks fabulous! Funny you'd mention the arugula, I took 1 look and wondered how you had arugula with all the heat you've been having :)! Of course, you explained. I think I may try that one for next year. I love having arugula, but it kind of annoys me because I wait for the leaves to grow a bit large and it seems to go from small to bolting! Maybe time to break down and buy a different. (Have been saving seeds from about 15 years ago, and they might not be a good variety for me.) Biggest cheapskate I know :)! Love the potatoes too and cast iron. Stay cool my friend! I also was afraid the leaves were going to be a little bit too spicy for my taste, especially in the heat, but I have to remind myself that nibbling a leaf plain in the garden is a lot stronger than tossing it in a salad. The taste was great. Now I just need to order some more seeds! Wow - great salad! And though I don't live as remotely as you do, I can empathize with the searching for 3 weeks to find a certain olive, since our local markets are limited. As always, I'm in awe of your garden produce, really and truly beautiful. This sounds so yummy! I love arugula... Makes me want to grow some in my own backyard. Great post! This looks so fresh and delicious! I'm on the "I'd love it" side of the fence when it comes to living on your farm. I adore living vicariously through you! I can relate to not being able to just run out to the store for a forgotten item too. Sometimes, ya' just gotta 'make do'! On a completely separate note, I posted a recipe on my blog today for Ginger Cream scones and I remember you saying you like to 'collect' scone recipes! ;-) More importantly though, I FINALLY took a foodie photo that I really like! LOL!! I've been meaning to make ginger scones for ages (they seem like they'd be perfect with a cup of tea, don't they? ), so I'm thrilled I won't have to start from scratch coming up with a recipe. Thanks! Sounds simply delicious, and perfect for this heat. Kalamata olives and feta with potatoes. Can't get better than that. I hear you about running to the market when so far away. I'm 35 miles....and forgetting an item is cause for a major come apart! Yes, adapting....and it is surely an art. Beautiful pictures as always. Yeah for Missouri!!! Although I'm in STL and have plenty of close stores! Good Luck with this heat! I've long enjoyed your posts, pics, recipies et al. Thought it about time I say 'hullooooo' and 'Thank you'! Issy (who has a grocery a bit closer than yours but it's an oh-so-basic sort 'o grocery store). In my attempt to have a healthy, not-so-heavy dinner last night, I suggested this salad. My family is a "meat and potatoes" kinda gang so of course their responses were a bunch of moans and groans it being JUST a salad. I added chicken to "beef" it up into a hearty dinner salad and it was a hit! We will definitely be making this again. I think this was the best salad I've ever had, or close to it! And I didn't even grow my own veggies. Yum. I had it as an entree with garlic bread, and it was very satisfying. Mmmm.